When I first started traveling in Pennsylvania, I had no idea how many great waterfalls there were. However, in the last three years, I’ve had the chance to visit more than 100 waterfalls in Pennsylvania. These have ranged from towering giants to small, but scenic falls. Some have been located in urban areas, while others have been located far from the nearest road. I’ve previously written about 10 of the easist-to-reach Pennsylvania waterfalls, but today I wanted to showcase some that require a bit more work to see. While all 10 of these waterfalls require some hiking, most can be reached in about five minutes of hiking along well-defined and easy-to-hike paths. 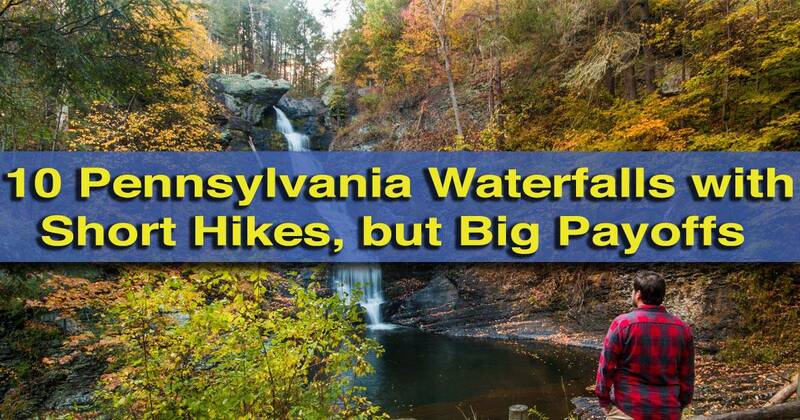 However, these 10 waterfalls in Pennsylvania offer big payoffs for those that visit. Pennsylvania’s tallest waterfall, Raymondskill Falls, is located in the Delaware Water Gap. Raymondskill Falls is the tallest waterfall in Pennsylvania, with three drops that total about 150 feet in height. 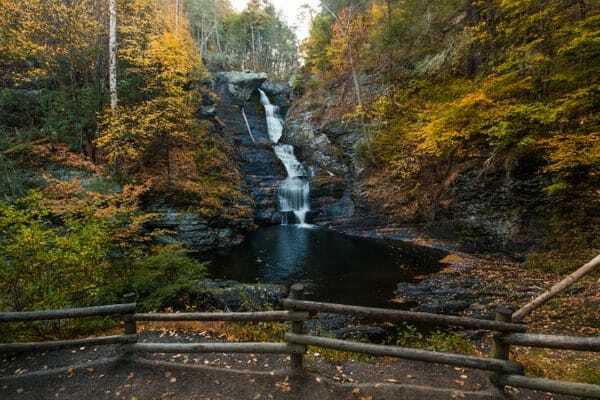 Located in the northern reaches of the Delaware Water Gap National Recreation Area, Raymondskill Falls requires a short, but somewhat steep hike to reach. There are two viewing areas, one just above the waterfall and one between the upper two drops and the lowest drop. This middle viewing area offers the best view of the entire waterfall, but both spots are worth checking out. Find out more about visiting Raymondskill Falls in our full article about this beautiful waterfall. 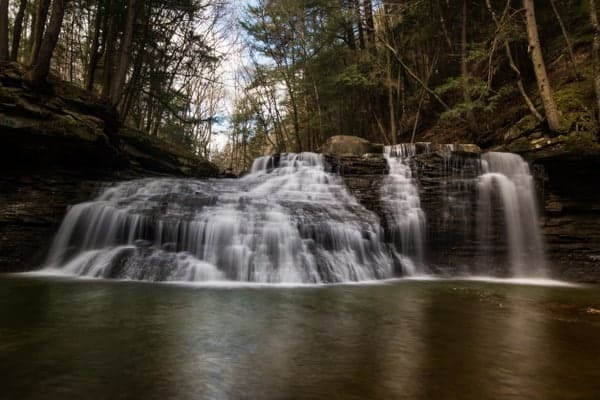 South-central Pennsylvania isn’t home to many waterfalls, but that doesn’t mean that there aren’t some beautiful waterfalls that can be explored. 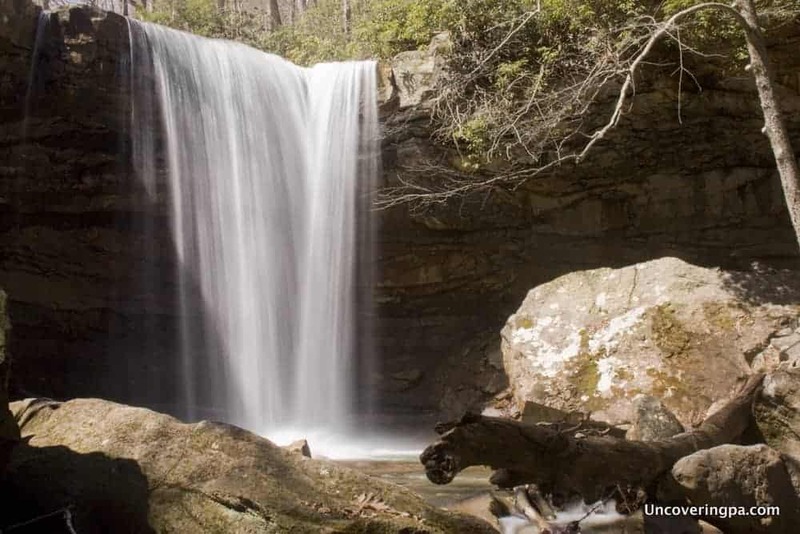 Located in York County, Mill Creek Falls is well worth the short hike required to see it. Found along the Mason-Dixon Trail, Mill Creek Falls is less than 100 yards from the road, but does require walking bit further due to the location of the parking area. Nevertheless, it only takes about five minutes to get to this beautiful waterfall. For those wanting to explore further, there is also another small waterfall a few minutes further up the trail. For more information, check out our full piece on Mill Creek Falls. There might not be another waterfall in Pennsylvania that offers a better combination of beauty and accessibility than Cucumber Falls. There might not be another waterfall in the state that provides as much bang for your effort as Cucumber Falls in Ohiopyle State Park. 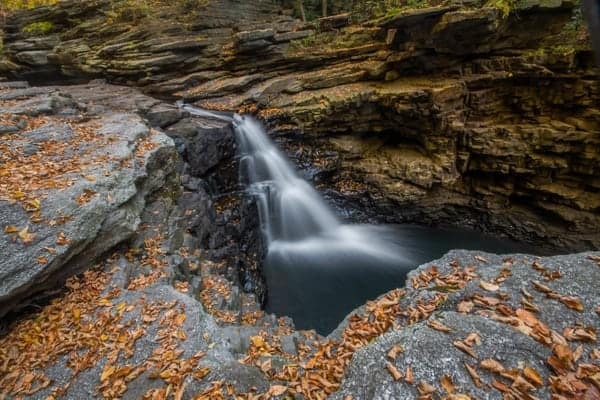 Located just a short distance outside of the small borough of Ohiopyle, this waterfall’s parking area is just steps from the top of the falls. Follow the path just a couple hundred feet for a great view from the top. If you want to get down to the bottom, it’s just a short flight of stairs to the base of the waterfall. You can even go behind Cucumber Falls, but it requires a bit of a precarious walk along the slippery rocks. Want to find out more? Check out my full article with information about visiting Cucumber Falls. The beautiful Nay Aug Falls in Scranton. Nay Aug Falls is a beautiful waterfall located in Scranton’s Nay Aug Park. Accessed via a wide trail, there are several viewing platforms, including a handicapped-accessible one. Getting to the lower viewpoint requires a short hike along varied terrain, but provides a great spot to appreciate this beautiful waterfall. In addition to the waterfall itself, it’s fascinating to see Nay Aug Gorge up close and imagine the power of Roaring Brook as it carved its path through the rock. 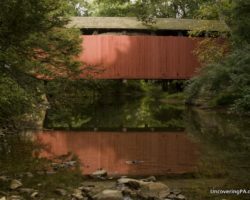 For more information about visiting Nay Aug Falls, check out our piece about things to do in Scranton’s Nay Aug Park. The upper portion of Fall Brook Falls in Tioga County, Pennsylvania. 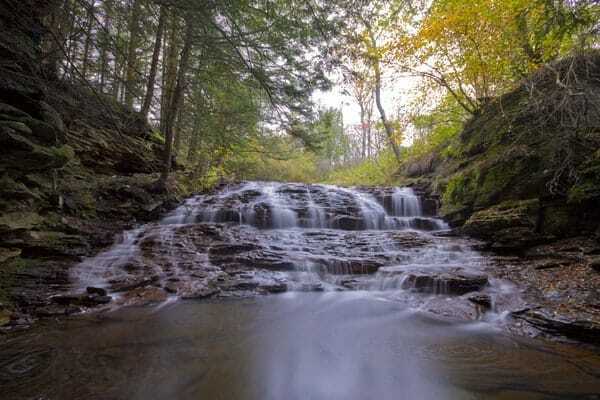 Located in southeastern Tioga County, Fall Brook Falls requires only a short hike to see. The waterfall is made up of two separate drops located close together on Fall Brook. The area around the waterfall was once home to a mining community and a railroad, but nearly all evidence of both are gone now. Instead, there is now drilling in the area, as evidenced by the equipment near the parking area. A short five-minute walk brings you to the top of the falls, where a fence has been built to keep you from slipping over the cliff’s edge as you peer down at the falls. Actually getting a close look at this waterfall is a challenge, but it’s worth visiting even if you just see it from above. 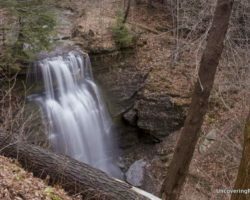 Find out more about Fall Brook Falls and the history of the area in our article about the waterfall. 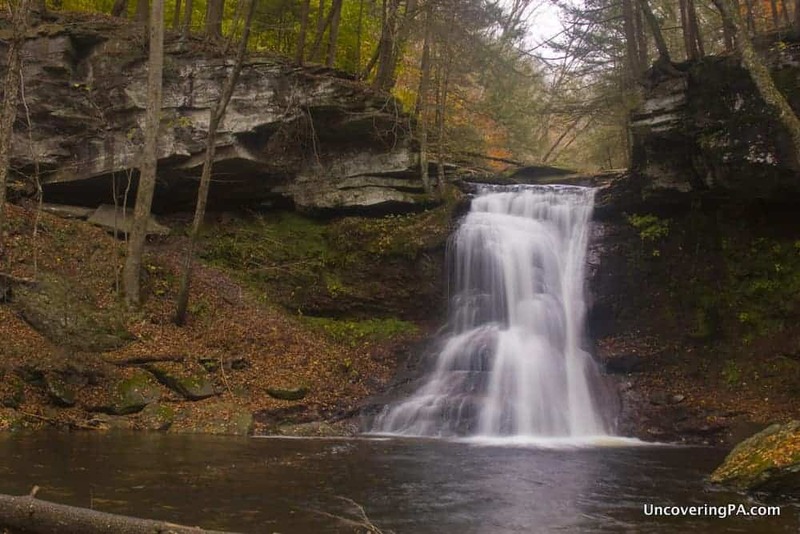 Northwestern PA’s Venango County is home to Freedom Falls, one of my favorite waterfalls in the region. About twice as wide as it is tall, this unique waterfall is well worth seeing throughout the year, but it’s especially nice during times of high water. A short, unmarked trail takes visitors down to Shull Creek, which drops 15 feet over Freedom Falls. This waterfall is perfect for both photographers and those who simply enjoy the beauty of nature. When visiting, don’t miss the impressive Rockland Furnace just a few hundred feet downstream from Freedom Falls. For more information, check out our article on Freedeom Falls. Upper Slateford Creek Falls is a beautiful, but little-known waterfall. Slateford Creek is located in the southernmost corner of the Delaware Water Gap National Recreation Area and is little known compared to many of the other waterfalls in the region. There are actually three waterfalls along a short stretch of Slateford Creek, however, the uppermost falls is the easiest of the three to reach. Hiking for just a couple of minutes will take you from the road to the bottom of this beautiful waterfall. A broad, but shallow pool is located below the waterfall, which extends about 20 feet up the hillside. The two other waterfalls along Slateford Creek are best reached from the bottom. Both require relatively short, but rather challenging hikes to see. The middle falls is especially impressive. Find out more about visiting Slateford Creek in our full article. 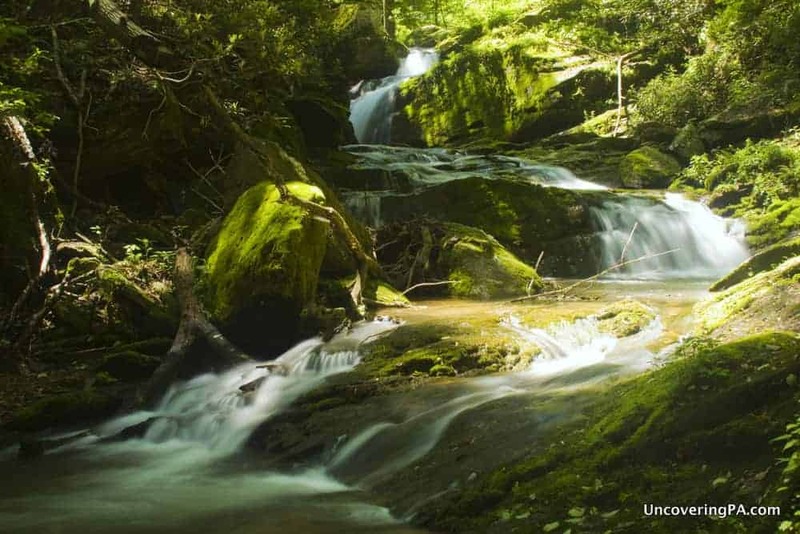 Sullivan Falls is a beautiful and easy-to-reach waterfall in the Endless Mountains of Pennsylvania. 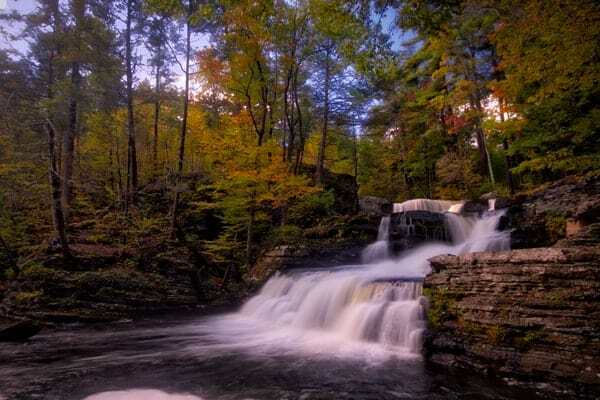 Sullivan Falls is located in Sullivan County’s State Game Lands 13, just around the corner from the popular Ricketts Glen State Park. As impressive, if not more so, than any of the 20+ waterfalls at Ricketts Glen, Sullivan Falls is well worth taking the time to see. Sullivan Falls is actually one of roughly two-dozen waterfalls in State Game Lands 13, but it’s easily one of the most impressive along with being one of the easiest to reach. A short walk from the unmarked parking area leads to the top this 30-foot waterfall. Getting to the bottom of Sullivan Falls requires a steep descent along a narrow path, but this waterfall is very easy to see from the top. For more information about visiting Sullivan Falls, click here. There are more than half a dozen Buttermilk Falls in Pennsylvania, but one of my favorites in the group is Buttermilk Falls in Indiana County. This waterfall sits on land once owned by the grandfather of TV legend Fred Rogers, and Rogers often visited this waterfall as a child. Today, ruins of the family home can still be found here, but the highlight of a visit to the area is this gorgeous waterfall. A wide path leads the short distance to a viewing area overlooking the waterfall. 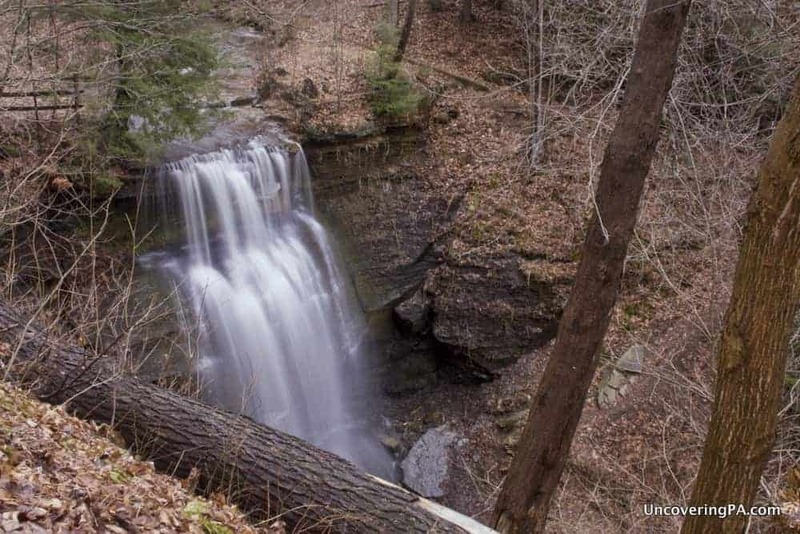 For more information, check out our article on visiting Buttermilk Falls. Factory Falls is one of three waterfalls at George Childs Park. Note that George Childs Park is currently closed due to damage from storms. Factory Falls is one of three beautiful waterfalls in George W. Childs Park in the Delaware Water Gap National Recreation Area. This waterfall is called Factory Falls because of the ruins of a 19th-century woolen mill that sit directly next to the waterfall. 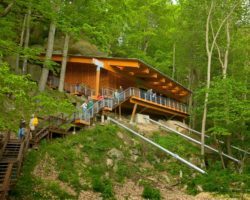 The waterfall is accessed via a wide path through the woods, and there is even a handicapped-accessible viewing platform. Factory Falls consists of two drops that sit at nearly a 90-degree angle to each other. Further downstream are two additional waterfalls that are even taller. If you have the time and energy, the hike along the well-maintained paths to these waterfalls is highly encouraged. Find out more about visiting Factory Falls and the other falls at George W. Childs Park here. 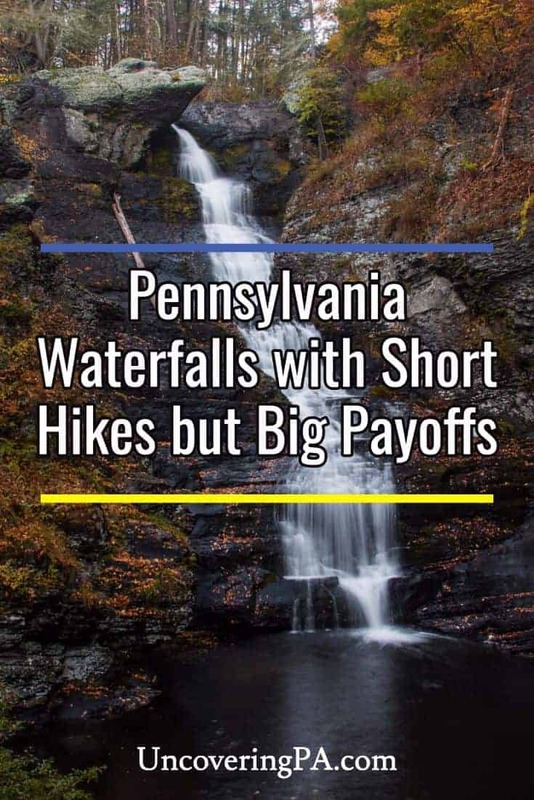 Want to see more waterfalls in Pennsylvania? 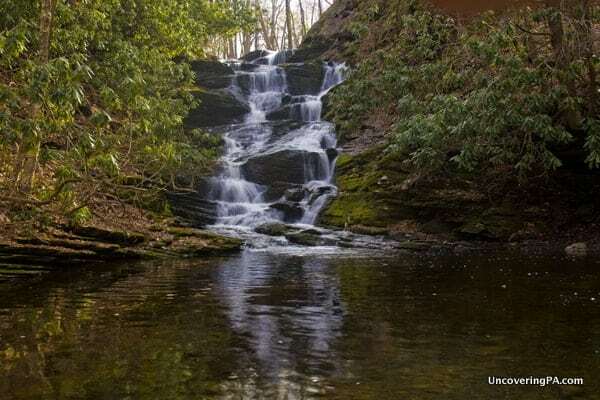 Visit our Pennsylvania Waterfalls page to see visit recaps and recommendations for dozens of waterfalls around the state. Thanks for the list Jim. I’ll have to add Sullivan Falls to my list of places to visit. 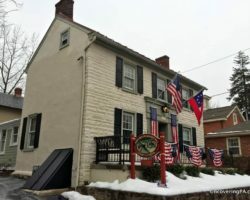 How about a list of cool places to visit In The beautiful state of ours for folks like my friend Jill who is wheelchair bound due to spina bifida ? I do have an article about waterfalls that require no hiking to see. 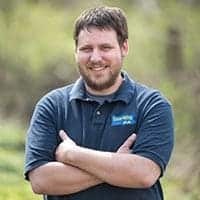 Most, if not, would be able to be seen by someone in a wheelchair: https://uncoveringpa.com/easy-to-reach-pennsylvania-waterfalls.